My life described in verse. This blind poet can sure converse. Was truly written from the heart. The permission to live could start. Sometimes in our darkest moments, we can find a sliver of hope in the light of another. For Suzanne Clarke who is losing her eyesight to Retinitis Pigmentosa (RP) another living with the same disease became her hope. In the attached video Suzanne reads a stirring poem (beginning at 5:14) inspired by Blind Poet, Dave Steele. Dave, who also has RP, is the author of the Stand By Me RP book series. When Suzanne sent me her video I couldn’t wait to share it with you! Like so many others who’ve lost sight later in life, we share so much in common. Our commonalities help uplift those new to sight loss by showing them there is hope and life without sight. 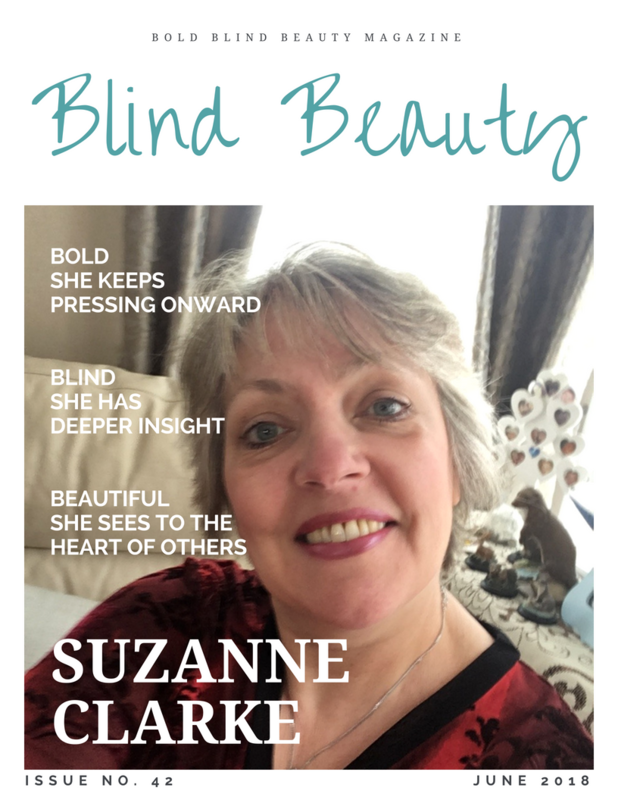 Suzanne, thank you so much for allowing Bold Blind Beauty the pleasure of sharing your story. The image is a faux fashion magazine cover titled Blind Beauty. Suzanne is on the cover smiling brightly for the camera and sporting her sassy short silver hairstyle. She is wearing a red and black floral v-neck top. This post and video blessed me, and my husband Art so much! For most of last year I was working 7 days a week, and blogging came to a halt for me. Now I am working only on the weekends, and am so happy to be catching up on my blog reading. Art’s incremental vision loss has been progressing, but he is in good spirits. I, too have suffered some vision loss that has left me quite nearsighted…can no longer recognize faces across a room. I was diagnosed last year with a condition called keratoconus. I am not a candidate for surgery or cross linking at this time. My left eye is affected worse than my right eye, but my right eye has a cataract, too., but they don’t want to do surgery for that at this time. I passed my driver’s test by the skin of my teeth a few months ago. I’m so glad I live in a small town where I can drive slowly and avoid lots of traffic. Theresa!!!!! Oh my gosh how are you?? I’ve missed you and am so far behind blog visitations it’s ridiculous. I remember you telling me of your husband’s sight loss and it’s heartwarming to me to know that you both are blessed by Suzanne’s video. I was telling Suzanne that just like Dave Steele inspired her, so to will she inspire others. I’ve heard of keratoconus but don’t know too much about it. Is it a progressive disease? You are fortunate to live in a small town that enables you to continue driving. The last year that I drove I limited myself to a five mile radius because it was familiar but then had to give it up completely as my sight loss continued to deteriorate. I have missed you, too. It is progressive, but often stops progressing after you’ve entered your 50’s ,and I am 51. It is a disease of the corneas. They get thin and cone shaped, and you lose the ability to focus. I can’t wear glasses anymore. I am supposed to wear hard gas permeable contact lenses, but they are expensive , so it will be awhile before I get them. Okay, yes, it’s coming back to me now. A friend of mine who was diagnosed with this had to get the contacts a few years back. It boggles my mind just how many eye conditions/diseases are out here. If you don’t mind my asking, have you received a referral for low vision rehabilitation? It may be something worth considering. No, not yet. I am supposed to make an appointment to have another examination soon. Thank you for sharing that option. I never considered it for myself after all of these years being married to a legally blind man. I guess the reality of my situation hasn’t sunk in. I can see the computer screen to read okay, but when I cover my right eye it is a big blurr. The right eye has a cataract starting to form. But it must not be very bad. I just wonder if they will be able to remove it when it gets worse, being my corneas are thin. Unfortunately, many people don’t get these referrals because it never comes up during the eye doctor visits. I didn’t know low vision evaluations were a totally separate process from my regular eye exams and didn’t get one until after I was told there was nothing more that could be done. Had I been given the referral sooner I at least would have known about devices that could help me. I read an article last year that said something to the effect that ophthalmologists were being trained to make these referrals early on in the process of sight loss. Before I had my cataracts removed I didn’t understand how much light wasn’t coming into my eyes. After they were removed even though I didn’t get more sight the amount of light increased significantly. I’m not sure how it works when a person has thin corneas and cataracts. Hi! First of all I must apologise for not replying sooner. I’ve not blogged before but have now signed up! Thank you so much for your reply and for watching my video. I’m on a mission to reach out and share, having spent almost a lifetime keeping quiet. I’m so pleased you and your husband liked my video, and that you found it helpful. I have a cataract in my left eye too. And like you they won’t operate yet either. I’m so pleased to have met you. Reaching out, connecting and building each other up, is what it’s all about. Thank you again! Thank you very much for your reply and for watching my video. I’m on a mission now, to reach out, share, help and inspire more people. Having spent almost a lifetime being quiet! I’m so pleased that you and your husband found my video helpful. I was a little nervous, but once I’d started I was ok. I have a cataract in my left eye. Like you, it’s too early to operate yet. I’m really pleased to have met you Theresa. Connecting, sharing and lifting each other up, is what it’s all about!